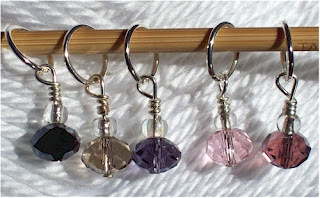 Great for gifts or your own collection, I'm offering two different color sets of stitch markers, Napa Valley (pictured right) and Caribbean Waters. Each set includes 5 markers and is packaged in mini envelope with ribbon tie closure for safe keeping. Holes are reinforced with eyelets for extended life (see picture below). To purchase, please visit my Etsy store or follow the links above directly to product pages. Additional color options are on the drawing board, including some beaded designs, so be sure to check back often!